Tomorrow sees the opening of a major exhibition in the rich Principality of Monaco which will link its Oceanographic Museum – once run by Jacques Cousteau – with Australia's Indigenous understanding of the sea and water resources. More than 150 Australian artworks – many of them commissioned to match the scale of the grand, water-front building - will be on show, plus a complementary Oceania exhibition. Even the titles of the exhibitions are grand - 'Taba Naba – Australia, Oceania, Arts of the Sea People' is the overall name, using the title of a Torres Strait Islander children's song. But the coastal Queensland element is challengingly called: 'Australia: Defending the Oceans at the Heart of Aboriginal and Torres Strait Island Art'; perhaps it sounds better in French! Then there's 'Living Waters', revealing hinterland Aborigines mastery of watery survival; and 'Oceania islanders: past masters in sea navigation and artistic expression' – another mouthful. It seems that this Oceanic presence on the Mediterranean came about when French specialist dealer, Stéphane Jacob, director of the Parisian Arts d’Australie gallery, encountered Robert Calcagno, now Director of the Museum, in Australia. Calcagno would introduce maritime art (including Damien Hirst's sharks) to a museum which has the enthusiastic patronage of His Serene Highness, Prince Albert II of Monaco, and Jacob was quick to suggest an Australian season. He brought in the Brisbane gallerist, Suzanne O’Connell, WA academic Erica Izett, and French tribal art expert, Didier Zanette. O'Connell's role briefly became controversial when she received the largest grant in the first round of the Federal Government's new Catalyst program – with the project's $485,000 grant (out of a $540,000 total) condemned as improperly going to “a commercial dealer”. In fact, this was a substantial portion of 'Defending the Oceans' $1.24m budget, most of which went straight to artists from the Torres Strait, Cape York and (strangely) Ceduna in South Australia. Twenty artists will travel to Europe, talking, dancing and taking part in educational programs in Monaco and Lyon. Other funders for a project which certainly fulfils the Catalyst criteria of being “ambitious” and involving “cultural diplomacy” included the Queensland Government – which has supported dealers in the past to sell its State's art overseas – private patrons and the Australia Council. Asked about the criticism that curators from the public sector would have been more appropriate to put together a show for an international institution like this, O’Connell's tart reply was, “They could have if they’d thought of it first”. A reasonable response. So the 'Defending the Oceans' component is the Big One. Alick Tipoti, for instance, has matched Lena Nyadbi's rooftop effort at the quai Branly museum in Paris by covering the Oceanographic roof in a 670 sq. mtre. sea turtle. Inside, he has a bronze dugong by moonlight. Ken Thaiday Snr and Jason Christopher are continuing their Sydney Biennale combo with a huge red wall work adapting the traditional Torresian feathered headdress, the Dari to become a frame for a doorway and windows. Outside again, Girringun artists from FNQ have outsized their Bagu puppet figures to become a field of giants greeting arrivals. Behind them, Brian Robinson's artful crabs crawl over the museum facade. 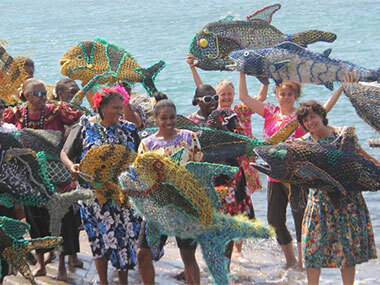 Finally, Erub Islanders have joined forces with fellow sufferers in Pornpuraaw on Cape York and Ceduna's Tjutjuna Art Centre to weave up a storm of sea creatures from ghost nets discarded by the fishing industry. Prince Albert also has an interest in the plasticisation of the oceans. 'Living Waters' presents a selection of more than a hundred contemporary Aboriginal paintings from the Sordello & Missana Collection in Antibes, as well as works by desert and Arnhemland artists commissioned to illustrate the themes of the exhibition and their relationship to water. A video and photographic installation by a collective of young Aboriginal artists poses questions of the sacred and profane related to water. Michael Cook, Judy Watson and Christian Thompson feature. 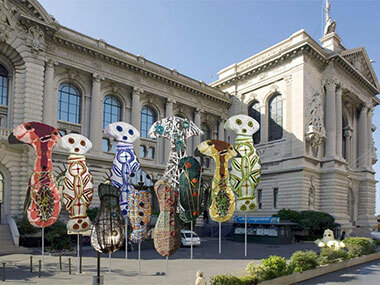 But so do Kitty Malarvie, Paddy Simms, Nyarapayi Giles, Paddy Bedford and Emily Kngwarreye. Intercultural collaborations from Yirrkala between Mulkun Wirrpanda and John Wolseley, and between Barayuwa Mununggurr and Ruark Lewis add variety. Indigenous paintings from Prince Albert's private collection are also exhibited. Bringing the Pacific Islander vision together with those of Australian Aborigines in 'Oceania Islanders: past masters in sea navigation and artistic expression', reveals similarities as well as differences. Didier Zanette focuses on the cultural relationships that these so-called 'Argonauts of the Western Pacific' have with the sea, through a presentation of traditional navigational objects, objects of prestige from the Solomon Islands, a series of Papuan portraits and a set of large-scale Baining tribal marine animal dance masks from East New Britain intended for their legendary fire dancing ceremonies. It's intriguing how the world is growing to accept that Aboriginal people, primarily thought of as people of Country – ie land – are now associated with the sea. I suspect this began with the Blue Mud Bay sea rights case lead by Djambawa Marawili in East Arnhemland, which was largely proven through the amazing suite of Saltwater Barks that sea-rights holders painted to prove their knowledge. The national tour from 1999 to 2001 opened so many eyes to Indigenous understanding of such watery matters as navigation and the stars, piscine life and produce, boat-building and the mythological potential of the point where fresh and seawater met and engaged. I note that the Australian National; Maritime Museum – where the Saltwater collection ended up – has contributed to 'Living Waters'. I assume they've sent some of the barks. But I wonder whether the organisers considered simply taking the whole lot as a trove of knowledge the world should share? Coincidentally, Queensland is touring another maritime Indigenous art show currently, 'Saltwater Country'. Oddly it contains a preponderance of urban artists rather than Saltwater people, and its website http://saltwatercountry.org can only tell me: 'Regional Tour 2015–2017: Queensland, New South Wales, Victoria, South Australia & Western Australia'. So, I've no idea where it is; but it has been to our Washington Embassy and to the AAMU museum in Utrecht, Holland. A mighty 3-volume catalogue will soon appear to record events in Monaco.